(Trent Nelson | The Salt Lake Tribune) The stir fry at Rawtopia Living Cuisine, where most dishes are packed with raw vegetables. 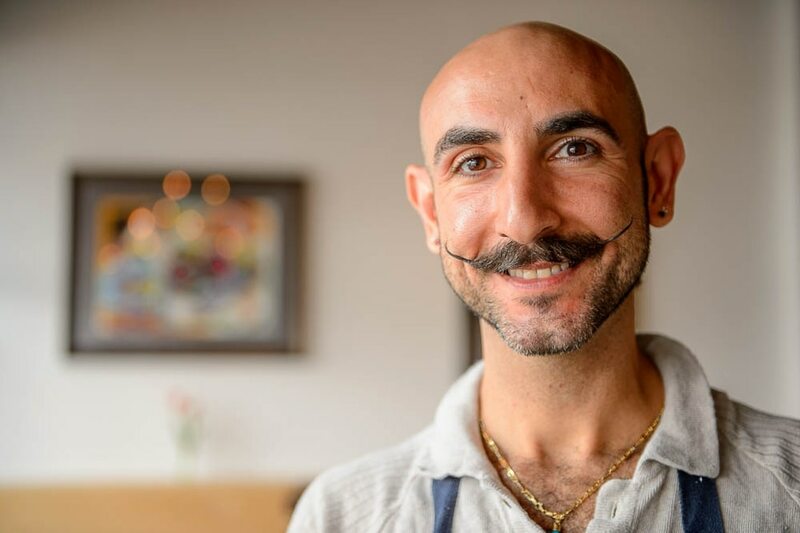 (Trent Nelson | The Salt Lake Tribune) Omar Abou-Ismail is the owner of Rawtopia Living Cuisine, a raw restaurant that recently moved to Millcreek. (Trent Nelson | The Salt Lake Tribune) Rawtopia Living Cuisine recently moved to Millcreek. (Trent Nelson | The Salt Lake Tribune) Omar Abou-Ismail, the owner of Rawtopia Living Cuisine, recently move his raw, vegetarian restaurant to Millcreek, adding some cooked dishes and healthy meats to the menu. (Trent Nelson | The Salt Lake Tribune) Rawtopia Living Cuisine, recently opened in Millcreek. (Trent Nelson | The Salt Lake Tribune) The bean burrito at Rawtopia Living Cuisine, a raw restaurant that recently moved to Millcreek. 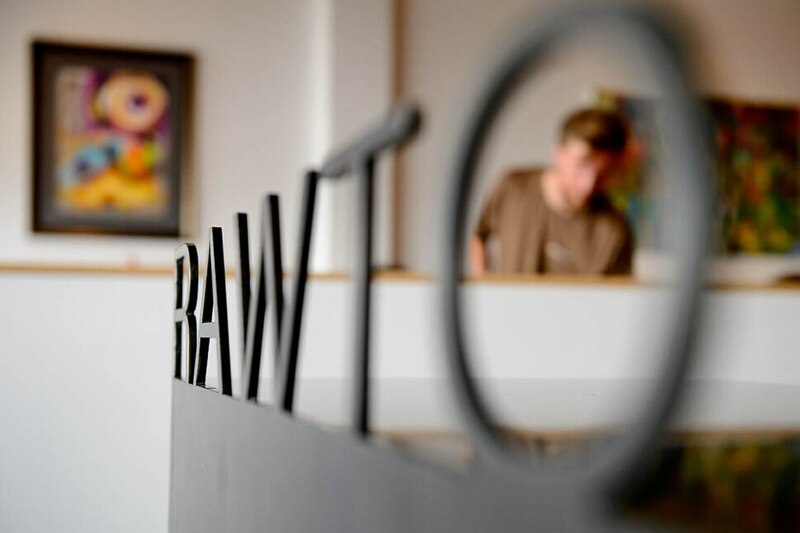 (Trent Nelson | The Salt Lake Tribune) Rawtopia Living Cuisine, a raw, vegetarian restaurant, recently moved to Millcreek. (Trent Nelson | The Salt Lake Tribune) Omar Abou-Ismail and Adrien Raigne in the kitchen at Rawtopia Living Cuisine, in Millcreek. (Trent Nelson | The Salt Lake Tribune) Stir fry at Rawtopia Living Cuisine, which recently moved to Millcreek. (Trent Nelson | The Salt Lake Tribune) Owner Omar Abou-Ismail in the kitchen at Rawtopia Living Cuisine. The restaurant recently moved to Millcreek. (Trent Nelson | The Salt Lake Tribune) The Labneh Pizza at Rawtopia Living Cuisine. (Trent Nelson | The Salt Lake Tribune) The Egousi stew at Rawtopia Living Cuisine, which recently moved to Millcreek. While most dishes are packed with raw vegetables, there are some cooked dishes and healthy meats on the menu. 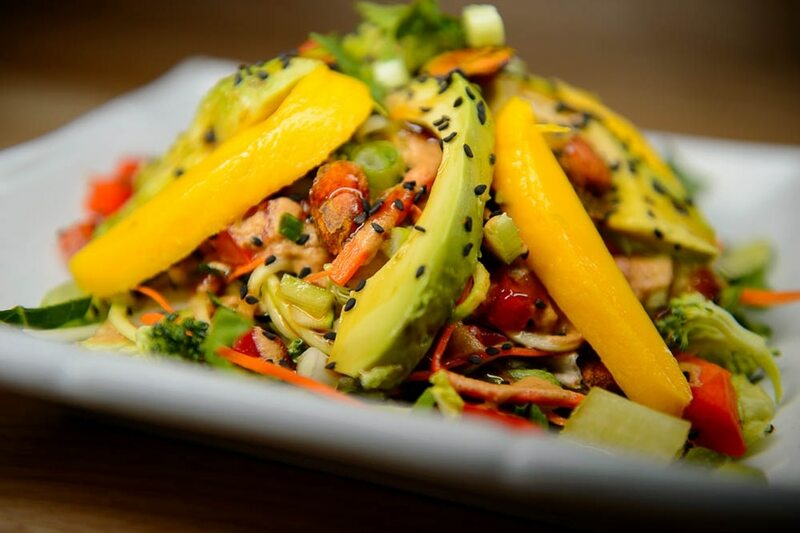 (Trent Nelson | The Salt Lake Tribune) Rawtopia Living Cuisine, a Millcreek restaurant where most dishes are packed with raw or dehydrated vegetables. The original restaurant was located in Sugar House, but restaurant owner Omar Abou-Ismail and his mother Jinan Abou-Ismail recently moved the business to Millcreek and added some cooked dishes and healthy meats to the menu, including salmon (pictured). Millcreek • Before dining at Rawtopia Living Cuisine and Beyond, it’s wise to set aside expectations of what certain foods should be. For example, that a pizza must have a doughy crust and cooked toppings, that a hamburger comes in a bun, or that a bean burrito tostada should be made with beans. If you are willing to set aside such prejudices you could be rewarded with a gourmet meal full of healthy ingredients and lots of flavor from liberally used ingredients like ginger, turmeric, coriander, mint, tahini, dried plantains and za’atar, a wild oregano harvested by the owner’s relative in Lebanon. The owner is Omar Abou-Ismail, who grew up in Lebanon and Nigeria and taught himself to cook after becoming a geophysicist. The menu highlights those country’s influences, but also features Asian and Mexican flavors. He and his mother, Jinan Abou-Ismail — who is the head chef at Mazza Middle Eastern Cuisine — both cook at Rawtopia, with Jinan’s dishes found throughout the Rawtopia menu. 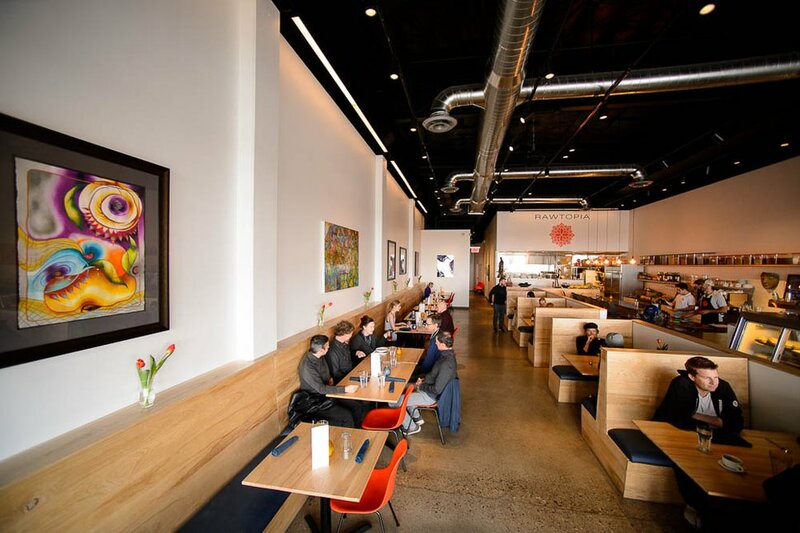 The place is a health nut’s delight in a simple setting — lots of white and natural wood with vibrant artwork hanging on the walls. Nearly every dish is made or garnished with almonds or walnuts or macadamias. Pureed cashews are transformed into vegan versions of sour cream and fry and Alfredo sauces. It’s all organic and gluten-free; thus, cabbage replaces buns and zucchini noodles sub for pasta. Nearly all the dishes are vegan, and the few meat options available are the healthy kind: bison patties or meatballs found in a salad or pasta, and wild-caught salmon in a West African stew. About the raw name: It used to describe the nature of all the foods when the restaurant was in Sugar House. And most of the dishes at the new space are considered “living cuisine,” which means lots of fruits and vegetables, of course. But also that the nuts, seeds and buckwheat are sprouted and dehydrated before being used in items like vegetable crackers, pizza and tostada crusts and chocolate caramel pie crusts. That apparently boosts their nutrient count by a lot. All of this may persuade the meat-and-potatoes crowd they will leave unsatisfied. A friend who raises cattle wondered if she would need to eat before she dined at the restaurant. Fear not. Many of the raw dishes are plenty filling. (Trent Nelson | The Salt Lake Tribune) Rawtopia Living Cuisine, a raw, vegetarian restaurant, recently moved to Millcreek. To start, try the hummus or tabouli (each $8). Both dips are served with the house-made sprouted-seed crackers made with flaxseed, almonds, celery and bell peppers. They are a good base for the traditional parsley and mint salad, topped with pomegranate seeds. Rawtopia’s hummus isn’t made with chickpeas—beans are harder to digest, says Abou-Ismail—but sprouted sunflower seeds and almonds. Chickpea fans may scoff, but it was creamy and garlicky and disappeared from our table. So did the frothy baba ganoush ($8). The raw Asian salad ($18) delighted with plenty of veggies (tomatoes, bell peppers, cucumber, celery, green onions and avocados) but its stars were the crunchy curried almonds and the chewy dried ginger-flavored plantains. (Trent Nelson | The Salt Lake Tribune) The labneh pizza at Rawtopia Living Cuisine. The lebneh pizza ($17) and bean burrito tostada ($21) were surprises. Their base was the same, what amounted to a large cracker made of sprouted buckwheat and flax seed that lay on a bed of greens. The “pizza” was topped with a vegan version of the thick Middle Eastern yogurt called lebneh (this one made with pureed cashews and macadamias) and chopped tomatoes, cucumbers, parsley and mint. 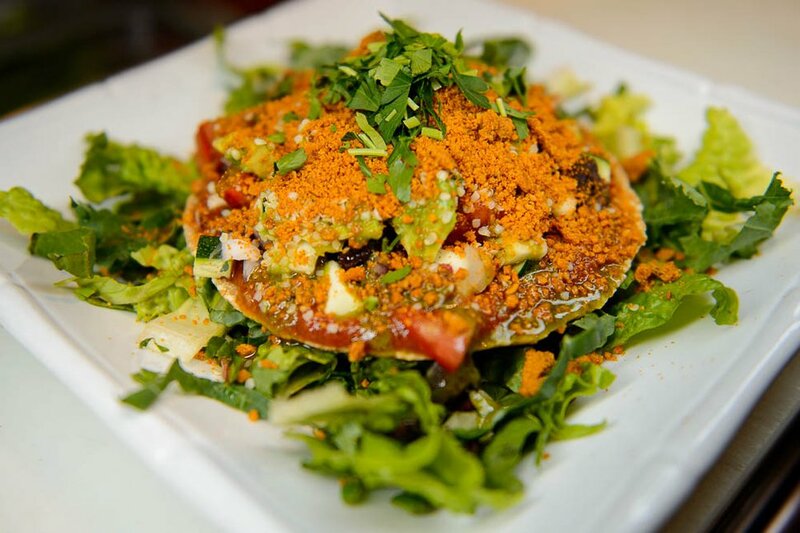 The tostada’s “beans” were made from pureed tahini, walnuts and pumpkin seeds liberally flavored with cumin — with a flavor and texture like refried beans — along with a dome of vegan sour cream and veggies. I wanted to love the raw seaweed roll ($16), but it was too much rice and not enough filling. There are so many good vegetarian burgers out there that I expected a lot from the raw nut burger ($16), but it featured an unsatisfying, walnuty patty overwhelmed by the cabbage wrap. Since Rawtopia moved to the Olympus Hills shopping center last August, the restaurant has expanded to include a handful of cooked foods — the ones with the meat, along with those featuring root and cruciferous vegetables. (Trent Nelson | The Salt Lake Tribune) The egousi stew at Rawtopia Living Cuisine, which recently moved to Millcreek. While most dishes are packed with raw vegetables, there are some cooked dishes and healthy meats on the menu. One of the best of the cooked meals is the hearty and rich egousi stew ($18, $29 with salmon). Spinach, chard and collard greens are cooked down and pureed with ginger, pumpkin seeds and almonds. 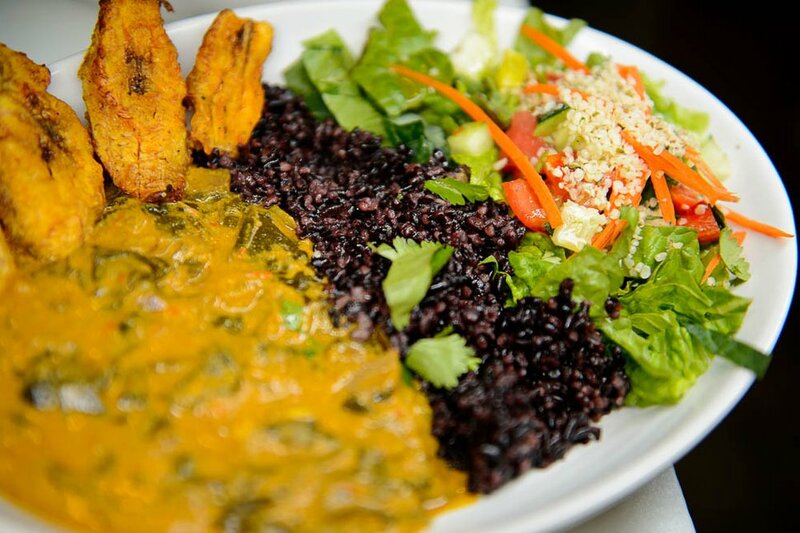 It comes with slices of plantains, black rice and a raw side salad (to help with digestion). In moving, Rawtopia also added beer, wine, hard cider and cocktails with a focus on Utah brands. There’s also a large selection of teas, kombucha, coffee and smoothies. Some vegan diners have complained that the restaurant added meat. But Abou-Ismail had the best of intentions when he expanded the concept. He didn’t want to leave out omnivores or those diners who like their foods cooked. “I just wanted to create a place for everyone,” he says. The one type of diner it could exclude is one on a budget. The prices are similar to what you’d find at a meat- or seafood-centric fine dining restaurant. They seem to reflect the organic produce and labor-intensive, from-scratch preparation — the raw foods take at least two days for the soaking and sprouting and drying. The desserts give just the right amount of sweet — but without the processed sugar. This summer, the root beer float ($9), with vegan ice cream in kombucha root beer, will beckon those diners willing to stretch their definition of root beer. The one ingredient I failed to mention is love. It’s listed on every item. Abou-Ismail says he cares about his diners’ health, the farmers, the environment. “It’s made with care and love so you can feel loved and nourished,” he says. This restaurant may be for the adventurous eater. Not because the ingredients are so foreign but because of the concept. Most dishes are packed with raw or dehydrated vegetables, though since moving from Sugar House it now includes cooked dishes and healthy meats, too. Hours • Tuesdays-Thursdays, 11 a.m. to 9 p.m.; Friday, 11 a.m. to 10 p.m.; Saturday, 9 a.m. to 8 p.m.; Sunday, 9 a.m. to 8 p.m. Brunch: Saturday-Sunday, 9 to 11 a.m. Closed Mondays.